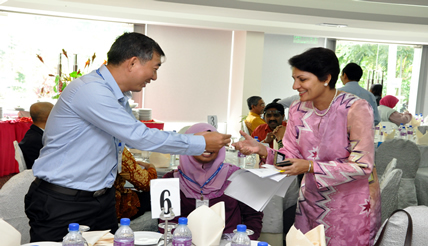 BANGI, 22 July 2010 – Representatives from 18 companies and various industries from around the Bandar Baru Bangi area were present at a network partnership building session with UKM academic staff and researchers today. The Deputy Vice Chancellor (Community and Industry Relation Affairs) Prof Dr Saran Kaur Gill said network building and partnership between the academia and the industry is important so that each party will recognise and respect each other’s needs and requirements. In her welcoming speech she said: “Industry can benefit through access to the university’s research findings and its capabilities as well as the recruitment of skilled interns and graduates. “The university in turn will benefit through participation in industry-based research and the contribution of industry expertise to the curriculum. Also present at the event were key academicians from UKM’s centres of research excellence and faculties, to explain and explore potential areas for collaboration with the industry. Among companies represented at the briefing at Puri Pujangga were Sony, Hitachi, Pharmaniaga, CIMB Bank, Padini Holdngs, Meditop Corporation, Derubayo Sdn Bhd and Equatorial Hotel Bangi. Prof Saran Kaur also briefed them on the workings of the university and its research capabilities. They were later feted to a luncheon.